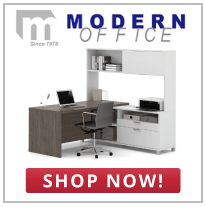 Modern Office offers a variety of office furniture and conference room tables to fit any need. However, if you don’t find what you’re specifically looking for, we offer the option to order custom conference tables. Select your own dimensions, color, size and even shape of your conference table. If you have a need for an unusually large conference table, if you have limited space in your office, or you have a small room in need of a conference table that fits properly, turn to Modern Office to order a custom conference table. When buying a custom conference room table, it’s important to think about your needs to ensure you find a table that meets these requirements. Think about the space you have, where it will go in the office or boardroom, and what its main functions will be. Think of the shape you’d like best. A circle table is great for key group conversations, where a long narrow table can be more beneficial for presentations. When working with a narrow office space or small area, measure the dimensions of the space. With the right dimensions, Modern Office is able to custom build any table to fit the space. We want to make it work for your office, so we provide the option to create the conference table you need. We can add or omit sections of any conference table or even include custom workstations to improve the workflow of the space. Measure your space, have an idea of what will meet the office’s needs, and contact Modern Office to build the perfect custom piece. In today’s world, technology is overtaking many aspects of business and consumer interactions. Stay ahead of the rest by customizing a conference or boardroom table with built-in power modules. Stay connected to technology, each other, and customers with a conference table that has built-in technology for lasting success. Our power modules can include data, USB, HDMI, outlets, and various customizable options. Be confident in every meeting and never lose power or connection again with a customized conference table. The best things to know before buying a custom conference table are the dimensions where it will fit, and a list of needs that will make your table the most useful for your workspace. With proper dimensions, we are able to build a conference table that will comfortably fit any area. Customize it with professional colors and wood finishes. We can even help match the aesthetic of existing office furniture and assist in selecting complementary styles. Build the perfect custom conference table to improve your workspace with Modern Office. Contact our knowledgeable experts today and let us know about your office furniture needs. We look forward to serving you.